alright, so this isn’t a cookie. but it is a ‘you can’t just eat one’ snack – and it’s chock-full of chocolate chips – and bananas! 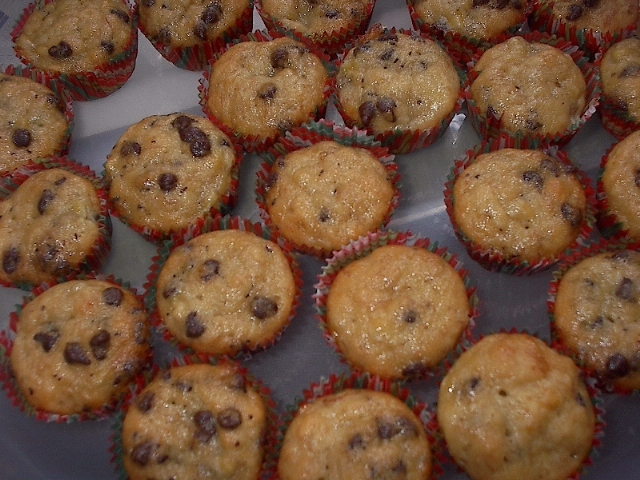 and since i made some for today’s snack, i thought you wouldn’t mind if i shared this recipe as today’s ‘cookie’…so, for today, the banana chocolate chip mini muffin has been named ‘honorary cookie’. these are ultra-simple to make, and they will fly off your countertop before you can wash the mini muffin pans. they are quite moist, they keep well for up to 3 days, and are favorites amongst kids and adults alike. if you’d like to make them even tastier, feel free to add 1/2 cup of chopped toasted walnuts to the batter. i tend to keep them nut-free for my nut allergy friends, but they are good with or without nuts! i received this recipe for the full-sized muffins from a friend a number of years ago… since then, i have tinkered with the recipe to make them bite-sized, and often serve them as a breakfast snack to the load-out crew at the rep. tomorrow, however, they will make their ‘opera debut’ when they ‘go to work’ with hubby! 1. preheat oven to 350 degrees. line mini muffin tins with mini muffin cups. 2. in a large mixing bowl, mix eggs, oil, brown sugar and vanilla until well blended. 3. add mashed bananas to wet ingredients and mix well. 6. with #100 scoop, fill muffin cups 3/4 full. 7. bake for approximately17-18 minutes, until muffins look firm and tops begin to lightly brown. 8. remove from oven, and gently remove muffins from pan onto wire rack to cool completely.